This week’s BEACON Researchers at Work post is by University of Washington research assistant professor Josephine Chandler. Cartoon version of microbial warfare. 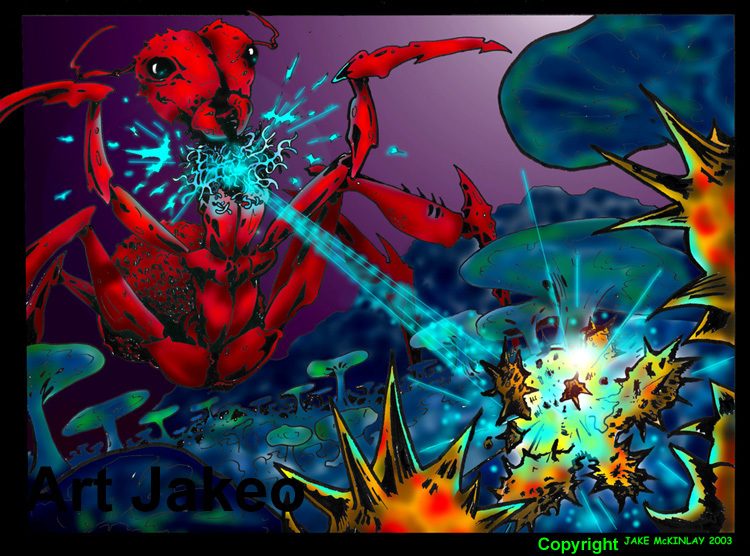 An ant (in red) grows a colony of bacteria (in blue) that can blast away another microbe (yellow) with antibiotics. 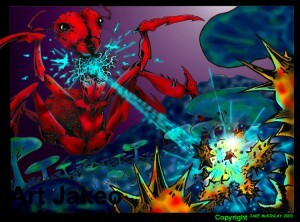 Image courtesy of Dr. Jake McKinlay, a former PhD student at Michigan State University and now a Professor of Microbiology at Indiana University (http://www.indiana.edu/~mckinlab). Competition occurs all around us, between people and institutions, and in plants and animals. In nature the battle for limited resources and space can be a fight for survival. Those individuals that have the skills necessary to win have an advantage and survive. Those that do not may die. Thus competition can be a strong influence in driving a population to change or evolve new traits or better strategies to win. Bacteria also compete with one another using an array of destructive compounds and strategies. Antibiotics, typically associated with their medicinal properties, are actually made by bacteria and other microbes and used as a weapon during competition. Antibiotics were first discovered by a scientist named Alexander Fleming. They were discovered by accident, after Dr. Fleming’s return from a month-long holiday with his family. Dr. Fleming had stacked up all of his experiments in a corner of his laboratory before leaving, and on his return he observed that one of the plates containing the bacterium Staphylococcus aureus had been contaminated with another microbe that seemed to secrete a compound that could destroy the Staphylococcus. Later he confirmed that the secreted substance, which he called penicillin, could kill a number of different kinds of bacteria. Eventually penicillin was mass-produced and used as an antibiotic to treat people, and its discovery is now said to have changed the face of medicine (Alexander Fleming was named one of Time magazine’s 100 most influential people of the 20th century). Not long after the discovery of penicillin, a number of other microbially produced antibiotics were discovered and developed for medical use. It was this story of the discovery of penicillin that first lured me to the field of microbiology, during an undergraduate course at the University of Iowa. Paper filter disks saturated with antibiotics cause growth inhibition on a plate spread with the bacterium Staphylococcus aureus. Image from phil.cdc.gov. 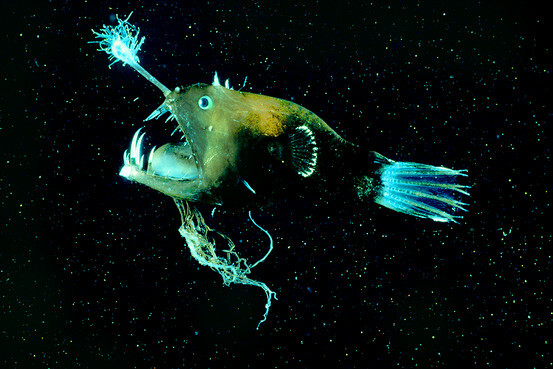 The anglerfish has an appendage off the tip of its head that glows because of bacteria that use quorum sensing to control production of light. The bacteria allow the anglerfish to attract curious prey in the deep ocean darkness. Image from http://si.wsj.net. A single bacterium probably cannot produce enough antibiotics to kill other bacteria (see Mlot C. Science 324:1637-1639). However many bacteria have evolved a way to ‘count’ themselves using a system called ‘quorum sensing.’ Quorum sensing involves communication between bacteria using small diffusible signals. Antibiotic production is energy-expensive and it is thought that quorum-sensing control may reduce the overall expense by delaying production until there is a sufficient population to produce a killing antibiotic dose. Thus quorum sensing may provide a winning edge during competition. Bacteria are constantly competing with each other in the environment and this may have influenced the evolution of quorum sensing systems in bacteria. Our laboratory is interested in the connection between quorum sensing, antibiotic production and competition among bacteria. 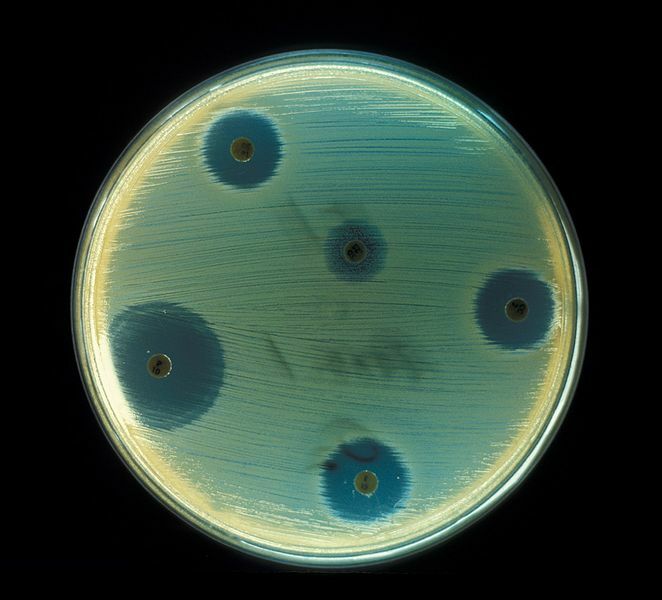 To examine these connections I created an experiment in the laboratory using two soil bacteria, Burkholderia and Chromobacterium, that each use quorum sensing to regulate antibiotics. I first showed that the antibiotics produced by each species can inhibit growth of the other. Next, I used bacterial mutants that don’t quorum sense to show that in each case the ability to compete is enhanced by quorum-sensing regulated antibiotics. Next I was interested in understanding the benefits of using quorum sensing to regulate the antibiotics during competition. To do this I teamed up with a physicist and a mathematician and devised a mathematical model of our laboratory system. The model used a series of differential equations that allowed us to vary parameters for bacterial growth, antibiotic-induced death, and quorum control of the antibiotics. We also incorporated a cost associated with antibiotic production. Using this method, we could change various aspects of the system and examine the different outcomes. For example, we could determine the effects on competitiveness when we made antibiotic more costly to produce. We found that the bacterial population competed better when antibiotics were produced at high density (vs. low density), such as by quorum sensing regulation. This was more pronounced when there was a large cost associated with antibiotic production. Thus our mathematical model supported the idea that quorum-sensing regulation of antibiotics enhances the ability to compete by sparing the cost of antibiotic production until there are ‘enough’ bacteria present. By using a combination of laboratory and mathematical approaches we have begun to study important questions about how quorum-sensing systems are important for bacterial competition. This work emphasizes how laboratory and mathematical approaches can be useful to study evolutionary questions and better understand the selection pressures that influence important bacterial processes, such as the production of antibiotics. For more information about Josephine’s work, you can contact her at jchan4 at u dot washington dot edu. This entry was posted in BEACON Researchers at Work and tagged antibiotics, BEACON Researchers at Work, Biological Evolution, mathematical modeling, quorum sensing. Bookmark the permalink.